Upcoming events in the Oakland-Berkeley area.Charles Chocolates in Emeryville, (6529 Hollis Street) is hosting FREE summer movies. Tonight's film is Soul Food and in honor of this movie, barbecue ribs, fried catfish and mac n' cheese will be on sale, (along with Charles Chocolates' Blue Bottle coffee services, hot chocolate and sweets). Food and snacks service will start at 6:30 and the movie starts at 9:00 pm. To order ticket click here. July 10 - Soul Food. July 24 - Tortilla Soup. Sheila Metcalf Tobin, (SheilaMetcalfTobin.com) will have her art on display at Herribone in Berkeley. Pretty Penny, (Rockridge - prettypennyclothing.com.) will be hosting their first Craft Bazaar, highlighting a group of local crafters. Down the street from Pixar Studios is the David Baker designed lofts at 1500 Park Street. 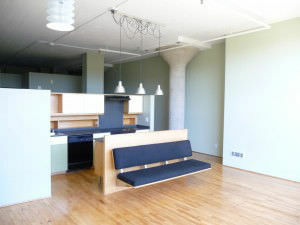 This is one of my favorite loft spaces in the East Bay. This building is in an ultra urban area of Emeryville and boasts the most lush, secluded garden as the entry. Once inside this building you will feel like you are in Eames territory. With a maple plywood mailbox area to the floor to ceiling windows, the modern space gives a nod to mid-century modernist.